J.C. "Jack" Byrd, Electrician's Mate 3/c, born May 23,1914, Cleburne, TX, completed high school and joined the USN July 13, 1936. He was stationed at San Diego NTS and in the USS West Virginia. 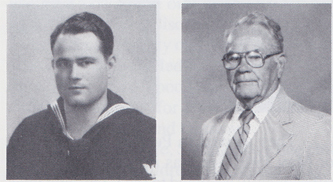 On Dec. 7, 1941, he was working at the Puget Sound Naval Shipyard. He was discharged May 29,1940, and received two medals. He retired from the Nuclear Power Division of Puget Sound Naval Shipyard as a structural planner and estimator on July 31, 1970. He lives in Bremerton, WA, with his wife, Wanda. They have one daughter and four grandchildren. He enjoys traveling.